You’ve heard us give our thoughts on Shiver by Maggie Stiefvater. Now listen in as Shannon and Kim tell you about their favorite parts, the ones that make them cry and the ones that make them rip roarin’ mad! We also give our reviews for Seers of Light by Jennifer DeLucy, When Blood Calls by JK Beck and Dark Flame by Alyson Noel. Try out the Audio, I promise Cole will not disappoint. 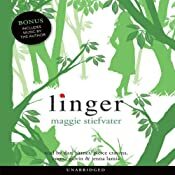 This entry was tagged alyson noel, books, dark flame, Grace, jennifer delucy, jk beck, Linger, Maggie Stiefvater, Reviews, Sam, seers of light, Shiver, When Blood Calls. Bookmark the permalink.